Over and over, our friends in the recruiting world keep asking us the same questions. 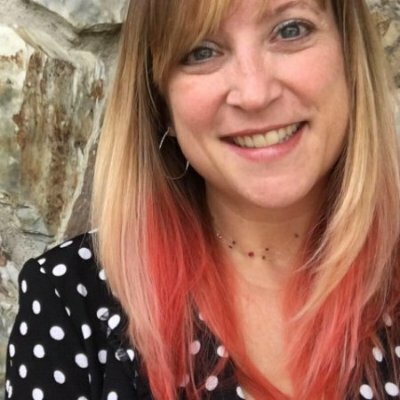 At conferences: “What’s your secret?” Over drinks and virtual Webex coffees: “How’d you do it?” In texts and InMails from connections: “How can we do what you’re doing?” Ever since Cisco completely turned around our employer brand in six months, everyone wants our Talent Brand Team to spill the beans. Everyone loves a good makeover story, and Cisco's talent brand looks entirely different—from not to hot! First of all, it’s not exactly a secret—especially since I’m about to tell you the key to our success and give you four examples (keep reading). But our transformation really boils down to one word. Candidates trust employees, not brands. So you need to trust your employees, too. On average, employees are trusted 16 points more than the CEO of the company! At a time when brands are getting a lot of shade, candidates are much more likely to trust actual, real-life, non-stock-photo human beings who work at your company. That’s why Cisco’s Talent Brand trusts our employees to tell our story, instead of being just another disembodied brand. We’ve been doing this for almost two years now, and people are still surprised at how simple our recipe is. Let’s look at four examples to see how we trust employees to build an authentic employer brand (and how you can do the same). The post is paired with a great photo of the employee. But in a telling sign of just how skeptical people are of brands—even with a story that personal—someone speculated that Monica was just a model pretending to be an employee. 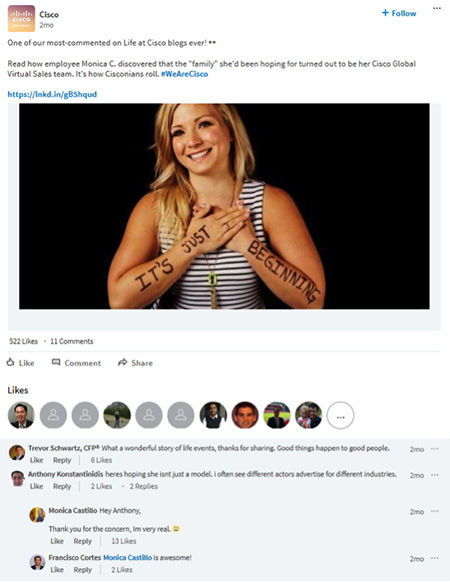 There’s your secret, folks—right there in the LinkedIn newsfeed update and a response. An employee told her own story, we amplified it on social, and the employee even got involved there, backing up our employer brand as real and authentic. Don’t be afraid to let your employees speak for themselves. It’s not your job to make up fictional employee experiences, you just need to amplify the real stories you find. 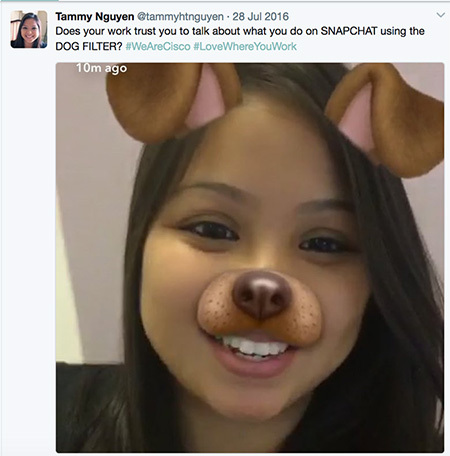 There’s an employee takeover of the WeAreCisco Snapchat account. Every. Single. Day. While our Talent Brand Team managers the program and the logistics (like calendaring, passwords, account security, and such), the content is 100% raw, authentic, day-in-the-life snaps from our employees. Here’s an example. Notice that Tammy herself calls out the T-word. It’s worked for us because we truly trust our employee ambassadors. We treat them like VIPs. We share metrics with them. We even got them some Snapchat spectacles to use. Is it scary? Hell, yes. Especially in the beginning. But after 11 months and 6.4 million minutes of Snapchat viewed (!!! ), we worry way less. Take a deep breath, find employees you really trust, and hand over the reins. Trust also means listening to your employees—and our Talent Brand has gotten pretty good at listening, because it provides incredible material for our content calendar. When someone uses #WeAreCisco on Instagram (or any other channel), we’re right there, commenting, liking, and often asking for permission to share that photo from the @WeAreCisco account. These are real-life photos of employees, and real-life examples of why they’re proud to be a part of the #WeAreCisco tribe. And our Instagram Stories are not “Snapchat light.” You’ll find different content there, but it’s still coming from employees, not a corporate branding exercise. Our employees send us videos, pictures, and ideas for stories—we just gather the pieces and put them together to publish as Stories. Remember that LinkedIn newsfeed interaction in example #1? It linked to our Life at Cisco blog—where you’ll notice that all posts are bylined by employees. Sure, not everyone is a natural writer, but our Talent Brand team is there to help coax out stories and edit for clarity. In the end, these are their stories and each employee’s voice shines through with only a few edits required. Every month, these Life at Cisco posts end up ranking in the top 10 most shared blog posts at Cisco—and they’re often some of the most viral, meaning they get lots of shares per view. Amplifying employees voices can be just as successful on your internal blog as on external social media. In fact, these long-form posts are a perfect opportunity to really let employees share their experience in detail. The lesson is this: if you want candidates to trust that you’re a great place to work, you’ll need to trust your employees to help you get into candidates’ networks. If you don’t trust your employees, candidates probably won’t trust you, either. I hope you find the four examples above instructive, but remember, you don’t just want to copy what we’re doing. That’d just be mimicking us, and it probably wouldn’t ring true. Instead of trying to be Cisco, try to be you by trusting to your own employees to shape your employer brand. You’ll be happy you did—trust us (and them).